October 29, 2015 by Anna F.
I have written about NuSkin before. But if you don’t remember, here is the information. Nu Skin was founded in Provo, Utah in 1984. Since 1991, the company has operated in Hong Kong and Asia. In its international market, Nu Skin operates in over 50 markets, thanks to the over 1 million distributors. Over the years, Nu Skin has been accused of being a direct selling business that is nothing more than one that belongs to that long list of pyramid schemes and MLM scams. Yet, it still continues to thrive, and it still has many people who make an honest living working with their independent business. Yuu Avantra, who works for Nu Skin, makes $120,000.00 per month in residual income, and a yearly income of over $1 million dollars. I try to deliver great articles about MLM Top Earners to you and while Yuu Avantra is an MLM Top Earner, this guy is hard to find any kind of real information on the internet. I did find where Yuu Avantra had given to a Hands of Healing charity, listed here Yuu Avantra. 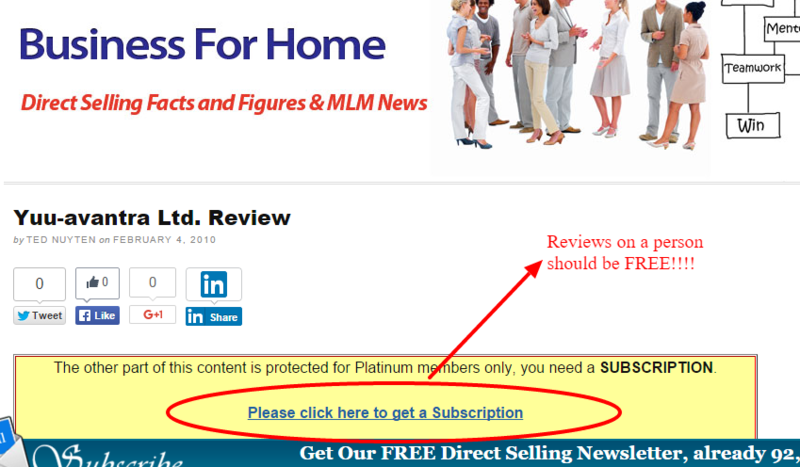 I find it strange that I have to pay for a ‘platinum membership’ at businessforhome.org to read a review on this person. But I suppose, if you are making that kind of money every month, you can hide from the internet too. But – that leaves me to question – if you are making great money and you have a great product, why would you NOT want to be found or learned about??? Nu Skin offers health and beauty products, as well as dietary supplements, that promote the idea of making a person feel and look younger. In the 90’s, Nu Skin invested in a Big Planet, a MLM company that sells internet services. This was probably due to the fact that internet was becoming big business, and people might not be interested in a cream that will make them look younger, but they sure as heck will be interested in internet service. Look at technology today. You can’t find one person without a cell phone and data service on it. If you do see someone who doesn’t have a cell phone, you look at that person like he or she is crazy. When Nu Skin enterprises acquired Pharmanex in 1996, a part of the proceeds go to the Nu Skin Force for Good Foundation (I will talk more about this later. This is an important organization for Nu Skin). Additionally, Nu Skin bought out LifeGen Technologies. The research database of LifeGen helped in the development of their ageLOC products. This network marketing company believes in helping its community. Since 1992, Nu Skin has sponsored the Utah Jazz Dancers. It also hosts one of the largest 4th of July celebrations in the country. Nu Skin was on Forbes 100 Most Trustworthy Companies in 2010. How did Nu Skin Start? When Blake Roney, Sandie Tillotson, and Steve Lund decided to start Nu Skin, their goal was to form a business that would provide personal care items made with ingredients that were all good for the body. In addition, they decide to promote their products to the world via direct selling. This way, they would be providing a great business opportunity for those individuals that put in the hard work necessary in becoming successful. These three didn’t have to wait long. Within hours of launching, their first product sold out. With a unique concept of creating high-quality products and offering a worldwide business opportunity, Nu Skin had the recipe for success. But what also helped in their success, and still does, is the devotion of their multi-level marketers and top mlm earners like Angela Liew & Ryan Ho, Betty Sung, and Mark & Tammy Smith. Commitment from all sectors is why Nu Skin generates over one billion dollars in revenue. The objective is to show the business world that it has the best consultants, products, and business model in the network marketing industry. Is Nu Skin a Scam? Today, Nu Skin wants to promote itself as the MLM business that can give people the economic security they are looking for. In times when corporations are laying workers off left and right, Nu Skin can give you the financial and time freedom you have always been looking for. Not to mention that most people, including baby boomers, are looking for products that will make them look younger. Health and beauty is a billion dollar industry. Everyone, even young folks, wants to look and feel great. Why do you think there are so many anti-aging products in the market? This is Nu Skin’s niche. It was smart enough to offer products that will never go out of style, like roller blades and an 8-track tape player. And with continuous research, this company will consistently grow. Similar to other direct sales companies, distributors receive residual income for every product they sell. If one of their customers decides to join the Nu Skin family, the distributor receives a bonus for the sales of their recruit. This is why Yuu Avantra, a distributor in the Japan market, has earned the position of Ambassador 12. I personally don’t know if any of the negative things said about Nu Skin is true or not, but I will say this, people seem to be doing very well with Nu Skin. One thing I notice about MLM distributors, is that they truly are goal oriented. I have written many stories about top earners, and I see that it wasn’t just enough to get the six-figure residual income. They wanted to earn a title, like Diamond, Ambassador, or Regional Director. You take the average person working a 9-5, and their goal is just to get paid every two weeks. Especially, when they have tried to get promoted, and it comes back naught. I think that is one of the biggest pulls to MLM. You get out what you put in. If you put in the hard work, you can see your independent business grow. Who wouldn’t be proud of that? No wonder these folks are all smiles in their personal videos (LOL)! I don’t know about anybody else, but I don’t mind working hard, especially if there is an end goal. The problem for me, personally, and I know others as well, is when you work hard, and you don’t even get a thank you. This is the type of stuff that happens every day in corporations and businesses. People have put in 15, 20, or 25 years, and these people don’t even think twice about laying them off. I don’t blame people for taking a chance in networking marketing, having their own home-based business. You might have to do everything yourself, from dealing with clients to ordering your own office supplies. You might not start off on a positive note, failing to make the income you thought would come quickly. But man, when you get that business up and running, and you get the satisfied clients, the ideal team members, it just all falls into place. I truly commend those that go into business for themselves. It is more satisfying than working for someone else. Seriously, it is usually said by people who still have to be at work at 8 a.m. and take their one-hour lunch. As I have said before, and it really bears repeating, you have got to surround yourself with people who are on the same wavelength as you when you decide to set personal and professional goals for yourself. This is the reason why so many MLM, including Nu Skin, sponsor events and weekly meetings among distributors. In the Bible, it talks about being “unequally yoked.” Most people take this to mean you can’t be with someone who doesn’t believe in the Christianity. While this is very true, it also is referring to the people you associate with on a daily basis. If you want to grow as a person, you have to be around individuals who are into personal growth as well. It is not only people, either. I have written personal stories of MLM earners (see my other blog posts) who said that when they decided to go into the network marketing business, they change the books they read, the audio tapes they listened to, the movies and videos they watched. If MLM doesn’t teach you anything else, it should show you this. Even if it doesn’t turn out the way you wanted the first time, try again. And Lord knows I have tried multiple times! But I have never given up on my dream and why should I, huh? Who else is going to do it for me? You would do this if you were looking for someone to begin a relationship with. You definitely would do it if you were looking for a job. Did you get the first company you submitted your resume to? If you did, more power to you. But if you didn’t (like so many of us), you would submit your resume to another company. Multi-level marketing works the same way. You have to find a company with services and/or products you believe in, with people you feel comfortable with. This is the true meaning of success. But if you are looking for true freedom where you not only help others, but also help yourself, then head on over to my Proof Delivered page and my Results page. Take a look at some of the real people that are killing it day in and day out!